Fitch Ratings Inc expects Macau-based casino operator MGM China Holdings Ltd to generate about US$700 million in earnings before interest, taxation, depreciation and amortisation (EBITDA) in 2018. The figure includes a US$220-million EBITDA contribution from MGM Cotai, the firm’s under construction new resort in Macau’s Cotai district, the credit ratings agency said in a Tuesday note. The HKD26-billion (US$3.34-billion) MGM Cotai (pictured) is likely to open in the fourth quarter of 2017, said in April James Murren, the chairman of MGM China’s 56-percent parent MGM Resorts International. 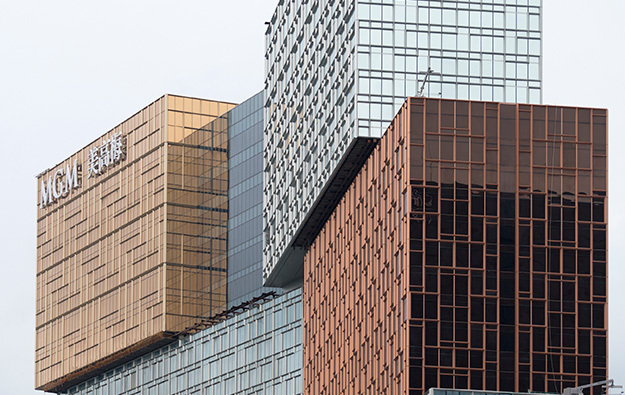 Fitch said that while it expects about US$220 million in EBITDA at MGM Cotai in 2018, it predicts an approximately 15-percent EBITDA decline at MGM Macau, in the city’s traditional downtown casino district. MGM Macau recorded adjusted property EBITDA of approximately US$143 million in the first quarter of 2017, up 25.3 percent compared to the prior-year period. In Tuesday’s note, Fitch affirmed its issuer default rating for MGM China at ‘BB’ and for the firm’s senior secured credit facility at ‘BBB-/RR1’, both below investment grade. Fitch also affirmed MGM Resorts’ issuer default rating at ‘BB’. The rating outlook for both companies was labelled ‘stable’. In an April memo the ratings agency forecast growth of 12 percent in Macau’s 2017 market-wide casino gross gaming revenue (GGR), with “equal contribution from VIP and mass market revenues”. Fitch said it expects the new properties opened in Macau between 2015 and 2017 “to produce some incremental demand for the overall market”. It does not however anticipate these projects “to ramp up to their full potential” until later in the decade when major transport infrastructure in Macau is launched, such as the light rail transit system. The credit ratings agency said in its Tuesday note that it expects MGM Resorts to achieve deleveraging “below 5.0 times gross leverage within the next 18 to 24 months, down from 5.6 times as of March 31, 2017”. Deleveraging at MGM Resorts “will come from EBITDA growth as National Harbor ramps up, MGM Cotai opens in late 2017, and the Las Vegas Strip remains strong,” added Fitch.